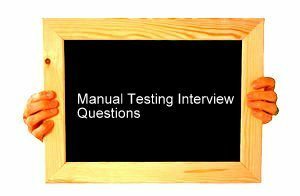 Before going into manual testing interview questions let us discuss the definition of manual testing. If any testing either functional or performance testing or load testing etc. are carried out with manual effort is called manual testing. Question 1) Explain the Process involved in Water Fall Model? Answer) Water fall Model is well suitable for developing small size of projects where the requirements are very clear. The most frequently asked question on manual testing interview. Question 2) Explain Agile Model? Answer) Every 12days, programmers who are working on the project should release the build and submit to client. User acceptance testing is done for every 12 days. So, whatever the problem comes, client may know how the project is going on. Question 4) Define Smoke or Sanity testing? Answer) It is a kind of quick test or rough test performed on the given build or s/w to ensure the given application is eligible for detailed testing or not is called as Smoke or Sanity testing. Question 5) What is Ad-hoc testing? Answer) If we test an application without following proper testing procedures and documentation, then it is called ad-hoc. Question 6) What is Gorilla testing? Answer) Performing uneven operation or zig-zag operation with an intention of making the system fail is called gorilla testing. Question 7) what is Beta Testing? Answer) It is the last level of acceptance testing, which is carried out at end users premises only. Question 8) Define Regression Testing and tell us why it is used? Answer) Regression testing is the process of identifying various functionalities in the modified build where there is a chance of getting side effects, then re-testing again these side effects functionalities is called as regression testing. New functionalities added or modification made or bug fixes may introduce side effects. Regression testing is performed to identify these side effects. Question 9) List out check list for security testing? Answer) 1) Check the data entered in secured fields like login, password, transaction pswd, credit crad cvv number, etc. are getting encrypted or not. 5) Check “view source code” option is disabled or not for secured pages. 6) Check “cookies”, whether data is encrypted or not. Answer) STLC will explains various major activities to be carried out in testing a project.